Perhaps you don’t think the change that is upon us is a profound one. But consider this: Within two decades, half the jobs in this country may be performed by robots. What then of our unemployment rate? And what of our social safety net? Opinion is divided. Will the next technological wave further skew the wealth distribution toward the uber-rich? Or will it ultimately create more entrepreneurial and job opportunities than it destroys? There is an interesting historical precedent for our situation. It was an era during which the technological firmament shifted just as abruptly as it is here and now. In the UK in the year 1800, the textile industry dominated economic life. Particularly in Northern England and Scotland. Cotton-spinners, weavers (mostly of stockings), and croppers (who trimmed large sheets of woven wool) worked from home. They were well compensated and enjoyed ample leisure time. (I)n the first decade of the 1800s, the textile economy went into a tailspin.… The merchant class—the overlords who paid hosiers and croppers and weavers for the work—began looking for ways to shrink their costs. That meant reducing wages—and bringing in more technology to improve efficiency… They also began to build huge factories where coal-burning engines would propel dozens of automated cotton-weaving machines…. The workers were livid. Factory work was miserable, with brutal 14-hour days that left workers—as one doctor noted—‘stunted, enfeebled, and depraved.’… Poverty rose as wages plummeted. Enter the notorious Luddites. Angry workers began to fight back. They destroyed the hated wide stocking frames and cotton-spinning machinery. They even killed factory owners. Soon, they were breaking at least 175 machines per month. And within months, they had destroyed some 800, worth £25,000—the equivalent of nearly $2 million today. The owners had taken to heart Adam Smith’s The Wealth of Nations. The book was published a few decades earlier. In it, Smith makes the case for a laissez-faire, free-market economy. In the ensuing centuries we have seen a seesaw battle between labor and capital. It certainly appears that capital now has the upper hand. But clearly, the Industrial Revolution did lift all boats. Can you imagine trying to support our present global population without our machines? The Information Revolution gave us computers, the Internet, and social media. The AI Revolution is about to give us self-driving taxis and trucks and robot baristas. Will these continue to lift our lower and middle classes? Or will they further disempower and impoverish them? Here’s what Clive Thompson thinks. The odds are high, according to recent economic analyses. Indeed, fully 47 percent of all US jobs will be automated “in a decade or two,” as the tech-employment scholars Carl Frey and Michael Osborne have predicted. That’s because artificial intelligence and robotics are becoming so good that nearly any routine task could soon be automated. Robots and AI are already whisking products around Amazon’s huge shipping centers, diagnosing lung cancer more accurately than humans, and writing sports stories for newspapers. They’re even replacing cabdrivers. Last year in Pittsburgh, Uber put its first-ever self-driving cars into its fleet: Order an Uber and the one that rolls up might have no human hands on the wheel at all. Meanwhile, Uber’s “Otto” program is installing AI in 16-wheeler trucks—a trend that could eventually replace most or all 1.7 million drivers, an enormous employment category. Those jobless truckers will be joined by millions more telemarketers, insurance underwriters, tax preparers, and library technicians—all jobs that Frey and Osborne predicted have a 99 percent chance of vanishing in a decade or two. But in the first decade of the 1800s, the textile economy went into a tailspin. A decade of war with Napoleon had halted trade and driven up the cost of food and everyday goods. Fashions changed, too: Men began wearing “trousers,” so the demand for stockings plummeted. The merchant class—the overlords who paid hosiers and croppers and weavers for the work—began looking for ways to shrink their costs. The workers were livid. Factory work was miserable, with brutal 14-hour days that left workers—as one doctor noted—“stunted, enfeebled, and depraved.” Stocking-weavers were particularly incensed at the move toward cut-ups. It produced stockings of such low quality that they were “pregnant with the seeds of its own destruction,” as one hosier put it. Pretty soon people wouldn’t buy any stockings if they were this shoddy. Poverty rose as wages plummeted. In mid-November 1811, that earthquake began to rumble. That evening, according to a report at the time, half a dozen men—with faces blackened to obscure their identities, and carrying “swords, firelocks, and other offensive weapons”—marched into the house of master-weaver Edward Hollingsworth in the village of Bulwell. They destroyed six of his frames for making cut-ups. A week later, more men came back and this time they burned Hollingsworth’s house to the ground. Within weeks, attacks spread to other towns. When panicked industrialists tried moving their frames to a new location to hide them, the attackers would find the carts and destroy them en route. 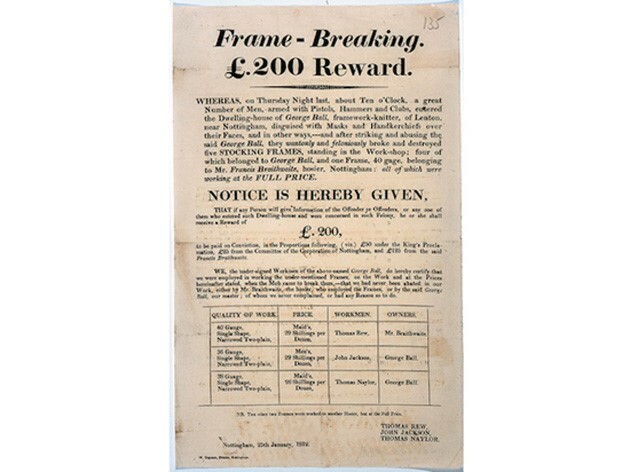 As a form of economic protest, machine-breaking wasn’t new. There were probably 35 examples of it in the previous 100 years, as the author Kirkpatrick Sale found in his seminal history Rebels Against the Future. 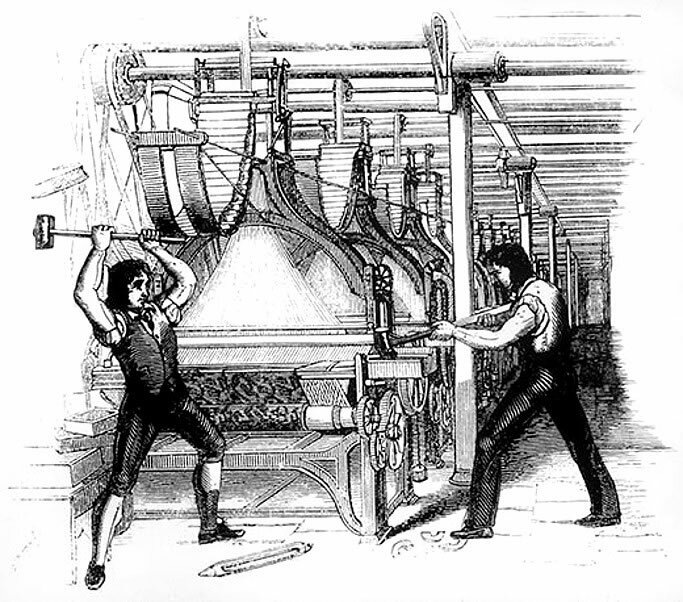 But the Luddites, well organized and tactical, brought a ruthless efficiency to the technique: Barely a few days went by without another attack, and they were soon breaking at least 175 machines per month. Within months they had destroyed probably 800, worth £25,000—the equivalent of $1.97 million, today.